So I watched through the entire series, and I don't know if that was good for me, but here's an updated review on my first one. Convenience is the real god of this world. Every plot thing resolved Conveniently. In fact, one of the only real net positives about the show, that romantic resolution and progress eventually happens, is only because it would be more inconvenient if it didn't. And Convenience is the absolute power in this show. Nothing, not even the overpowered isekai protagonist himself, may stand in its way for even one second. What is it, then? This show is stupid, of a level rarely seen. It surpasses normal light novel adaptation levels of stupid. I mean, what did you expect? The title alone is your tip-off. The very premise, the series summary you get in the sidebar, tells you exactly how worthless this show is going to be. Right? This show has no stakes, no drama, no conflict of any kind. Everything goes well for the main characters, everything. Forever. It's to the point where I find it absolutely hilarious, because I've simply never, ever, not once, seen fiction written like this. Well, I've seen one kind of fiction written like this where there's no actual conflict or complications, but that kind of fiction is not safe for work, or this website. They fill in the need for Interest, which is normally filled by plot conflict or character drama or stakes, with something else people really like instead. This series legitimately reads like they took a NSFW story like a doujin or VN, and just removed the lewd elements. If you want to know what bothered me about the protagonist, then watch Konosuba's opening scenes. Actually, wait. Just go watch Konosuba instead. This show highlights the extreme disconnect that can happen between a person's judgement of a show's quality, and their enjoyment of watching it. I think this show is dumb, but it's happy, it's pleasant, and I need happy and pleasant things in my life. I could and will find much better happy things to fill my time, but I can't deny this is fun so far. This is probably the most positive two-star review ever. Literally nothing new, but thats ok, its something to watch. The list keeps going, but i think you get the point, the show so far isn't inherently bad, its just nothing new. Sure theres better anime, but theres also worse, the humor is funny, not busting any stitches, but i cracked a smile. The action is copy paste action, but this is not the first show to do that, and probably not the last. The story will most likely end up where the rest of them do, nothing really happens for most of the show, then a "problem" occurs toward the end, and the protagonist saves the day some how. I will update the review if anything unexpected happens. Honestly, it's a fairly decent show. While it isn't plot-heavy and the main characters basically just live the easy life, it's a very pleasant show to watch. Everyone just has some light-hearted fun and everyone gets a happy ending. I would recommend it if you're in between shows and you need something to fill in that space. Show isn't as bad as people say, sure the main character is over powered. So what. Kinda funny and goofy but slighlty addicting. I mean what would you expect with a title like this? Fun show to pass the time. An Anime for People who like being Happy, and who also aren't Snobs! 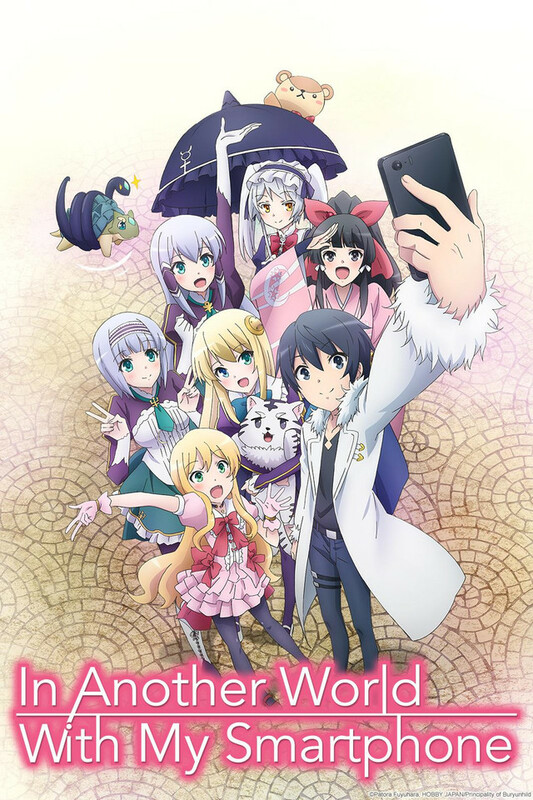 This anime is not 5 outta 5 stars type of anime, but it's good enough to pass the time and to possibly make ya wanna read the light novel (I know I ended up reading it). In any case, I think it's overall pretty good but it doesn't make you think or ponder stuff like Overlord, Re:Zero or Konosuba and so on. P.S. : Don't listen (unless you want to) to the anime snobs cuz they hate that everything that isn't pure diamond or gorey. The queue has countless series in it, that sometimes you want a series that is easy to say...boom they will always win. People often forget to sit back and just value entertainment, instead they nit pick every turn. That is what a queue if for, some have good stories, some have good development, and others are just for fun. chill ppl. 5 stars for the anime jesus. Read the LN to fill in a lot of the story. Also, they down play a lot or out-right remove when Touya actually uses his phone for things, which makes it seems like it has become instantly useless from the start after he learns magic. All in all, it's ok, but they seems to be going out of their way to make it as generic as possible. The other reviews have pretty much captured the essence of this show. It's pretty generic, the animation is lazier than I hoped it would be, and the story was never that great. I've been following the WN of this for over a year now, and this is pretty much what I thought we would be getting when I heard about an anime release. I don't know about the author's original intent, but this is the sort of show you need to go into treating it as more of a slice-of-life comedy without any deep story beyond that. Having said that, this show is the definition of a guilty pleasure for me, and I'll definitely be watching through the whole season regardless of how good (or not) it will be. I won't excuse any of its flaws, but I'll indulge out of an irrational affection anyway. And really, that's all you need to keep in mind when deciding whether or not to watch this anime. Everything about this anime is shallow from the plot to the characters, but it's good popcorn entertainment if you don't want to invest too much in a show. By keeping things light and not taking itself too seriously, the anime has some charm to it. Great if you just want some entertainment after a stressful day.